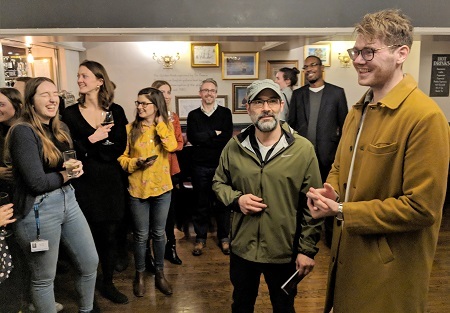 Mudlark, the name for a Thameside treasure-hunter, implies eclecticism, and guests at the launch of the HarperCollins non-fiction list - at the publisher's near-local, the Mudlark pub in Southwark - certainly got a varied show. We heard from, among others, a food writer who had travelled round France on a bike called Eddie, a tree-climber who had toured Britain's gravesites in a hearse (unnamed), and a submariner-turned-bookseller. 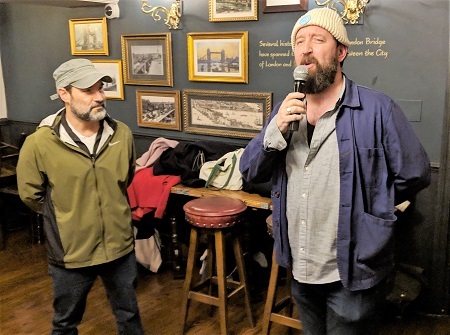 Publishing director Jack Fogg introduced comedian and broadcaster Adam Buxton, whose own memoir will be out from Mudlark this autumn and who conducted micro-interviews with his fellow authors. Joel Golby (Brilliant, Brilliant, Brilliant, Brilliant, Brilliant, out today, 21 September), who went on first, must have upset some deity in the past few days, because he had to contend with a buzzing microphone, the bells of Southwark Cathedral, and, briefly, a burst of music from the pub PA. But guests who picked out his book from the goody bag to read on the way home will have found that it went at least some way towards justifying the title. We also heard from Guardian food writer Grace Dent, whose Hungry (September) will trace her journey from Crispy Pancakes in Carlisle to navarin of lamb and suchlike at some of Britain's finest restaurants; Jack Cooke, author of The Tree-Climber's Guide and now of The Tomb Tourist (in the catalogue as Procession, date tbc), exploring our attitudes to death; another Guardian food writer, Felicity Cloake (One More Croissant for the Road, June); and journalist Derek A Bardowell, whose No Win Race (May) is a study of racism through the prism of sport. Then there was Waterstones' Richard Humphreys, whose memoir Under Pressure (September) recalls life in his previous job, on board a nuclear submarine. A few figures are enough to cause the imagination to flinch: 30 days under water; 140 men; 3 toilets; 3 showers; 0 soap; 0 fresh food. Also in Mudlark's first catalogue are Surprisingly Down to Earth and Very Funny by Limmy (out today), The Knife's Edge by heart surgeon Stephen Westaby (April), and Extraordinary Insects by Anne Sverdrup-Thygeson (April).